This video is about a beautiful steam locomotive. The steam train is loaded with coal and then the steam loco moves to the railway turntable. 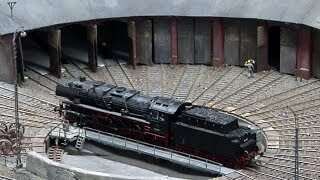 Then it moves into the roundhouse or engine shed. The entire model railroad layout is digitally controlled.